Goodyear has taken the problems that tires have when driving on rain and snow covered roads, and used new technology to come up with a premium all-season tire. The Goodyear Assurance TripleTred to better handle the elements with its exclusive TripleTred design. Three unique tread “zones” are featured in the tread compound that make up this tire. They include a deeply grooved rain water channel that gives it the ability to better eliminate water from under the tire, which reduces chances of hydroplaning. And ice zone down the center of the tread provides increased grip on snow and ice covered roads. Finally, the dry zone on the inside and outside shoulder of the tire help give it better handling and cornering capabilities on dry pavement. Overall, Goodyear has designed a very nice all-season tire that gets you where you want to go regardless of the weather. The 80,000 mile tread warranty is a nice benefit as well. 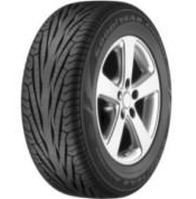 Prices for the Goodyear TripleTred range from approximately $120 for a 195/60R15, to around $200 for an 18 inch series. Who Is This Goodyear Tire For? The Goodyear Assurance is designed for drivers of minivans, coupes and sedans who are looking for a solid all-season radial tire that can be used in all types of weather conditions. Goodyear tires gives the Assurance TripleTred a 6 year/80,000 mile treadlife warranty. There is also a 6 year uniformity warranty with a free first year replacement followed by prorated treadwear. A 6 year materials and workmanship guarantee is provided with various treadwear and tread percentages. In addition, Goodyear also includes a 30 day test drive guarantee, as well as a 2 year roadside warranty.